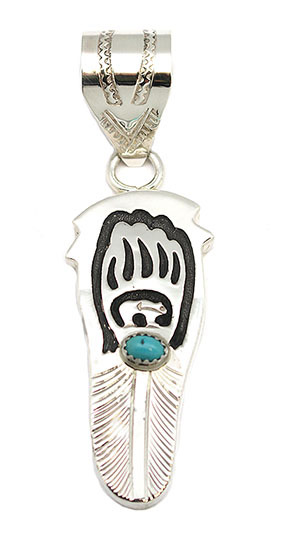 This feather style pendant is made of sterling silver and is hollow and backed with an overlay of a paw and small bear with one turquoise stone. It measures approximately 3" long including stamped bail by 7/8" wide at widest. It is Navajo hand made by Alonzo Mariano. Turquoise may vary in color shade and shape.